Fortunately, all these questions can be answered by using 3 simple frameworks that depict the natural evolution of technology, help us manage the risks associated with adopting new technology, and the pros/cons of adopting technology at different points in time. These frameworks are: The S-Curve of Innovation, the Technology Adoption Life Cycle and the Hype Cycle. 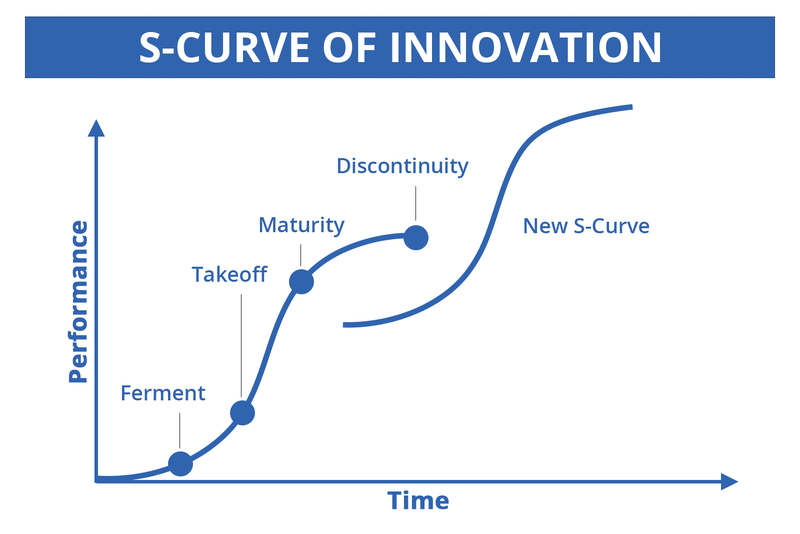 The S-Curve is one of the major concepts that explain the life cycle of technological innovations. Having a grasp on the concept can enable you to determine the maturity level of a specific technology. In other words, it helps you assess if the technology in question is new, mature or declining. The S-curve exhibits the performance of a technology in relation to the time taken for evolution. Any technological innovation goes through four performance stages and this curve helps decision makers ascertain the position of the technology in the market and its viability for their organization. ✓ Sales usually reach the physical limit. ✓ Product becomes standardized. Low or very small innovation at this stage. ✓ Customers start abandoning the technology and moving to a new solution. ✓ New innovation attracts the innovative consumers. ✓ Birth of a new technology life cycle, and thus a new curve known as Disruptive Innovation. 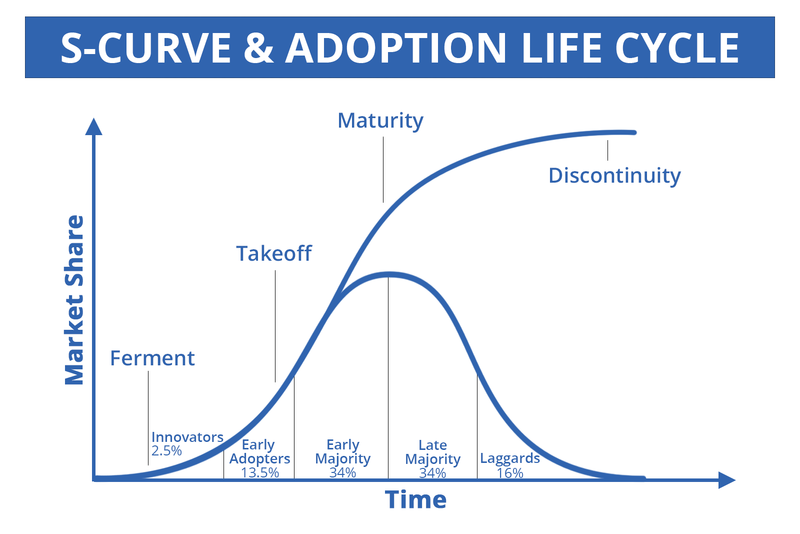 In essence, this curve is important to discern if a warehouse technology is about to get displaced and consequently, if it is the right time to adopt it. Here is where one needs to take a call for opportunity vs. risk. As market trends suggest, the acquisition of more than 16% of potential markets makes success and growth very likely, and that happens in the takeoff stage. For a warehouse that is considering adopting a technology, the best time is during the takeoff stage. The essence of this stage is rapid innovation and growth. Adopting in this stage grants access to rapid product improvements, valuable updates/upgrades, and terrific customer service. This curve affects your IT decision by informing you with the extent of risk involved and if it is too early, too late, or just the right time to embrace a technology. This concept, as Everett M. Rogers explains it, is based on identifying the personality traits of adopters in relation to accepting a new innovation. It is a sociological model, which very aptly applies to a wide range of technologies and innovations. With the help of demographic or psychological groups, it explains the pattern of adoption. There are 5 adopter groups, exhibiting traits characteristic to each. Roger describes it graphically with this Bell Curve. 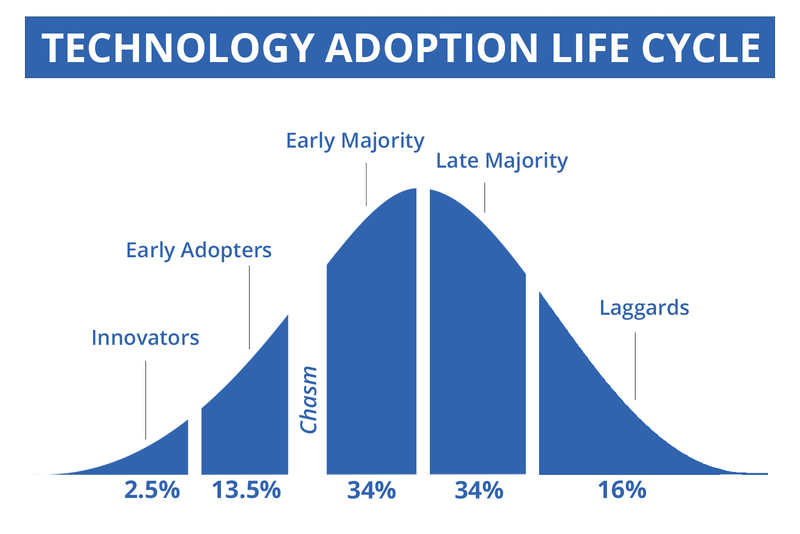 The chasm* of death is the transition between capturing the early adopters and the early majority. When an innovation manages to cross this chasm i.e. acquire more than 16% of consumers, it is believed to meet success. Here is where the fate of technology is decided. For companies embracing warehouse digitalization, this cycle provides a clear view of technology adoption in relation to time and attitude of the adopter. So, when a company moves ahead to adopt technologies like blockchain, IoT, AGVs, UAV, etc., it is important to ascertain before adoption as to where your business will stand in relation to the time line of adoption of an innovation. This assessment will help you evaluate if you are too late or too early and/or if you would be able to obtain any value from the adoption of the desired warehouse technology. Here is a representation of how the s-curve and the adoption cycle correlate. The early adopters and early majority groups tend to reap the maximum benefit. While the risk for the former is considerable, the latter reaps the benefits with little or no risk since the innovation has already crossed the chasm of death and is least likely to fail. Undoubtedly, these are two groups that will make the most of a warehouse technology by the virtue of timing. The innovators may or may not be the ones to reap benefits since the technology bears maximum risk for this category. 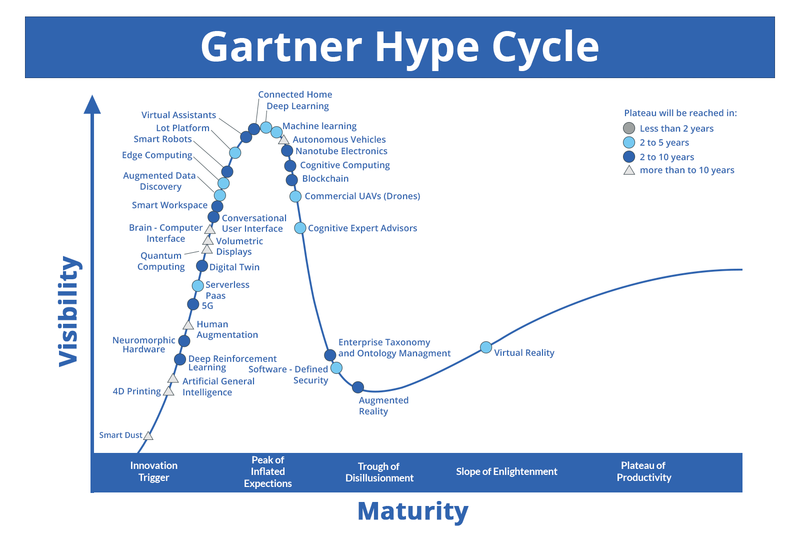 The Gartner Hype Cycle of Emerging Technologies is a research methodology created by Gartner, a research and advisory company. The company uses this methodology to trace the stages of the technology life cycle in relation to hype vs. reality. It represents graphically the course of maturity and adoption of an emerging technology or application. It helps finding if the technology in question is relevant in a real business scenario and if there are any new opportunities to exploit. The cycle is a descriptive (not prescriptive) view of the direction a technology or application is expected to evolve over a certain period of time. Practically, it provides insight into if you must or must not adopt a technology. ✓ Many companies embrace the innovation, others don’t. ✓ Performers innovate more to address problems and improve the product/solution. ✓ Second and third generation products may also be released. Here is the latest version from Gartner that presents the anticipated future of emerging innovations in technology, inlcuding technologies relevant to warehousing such as: IoT, Machine Learning and more. Gartner’s Technology Hype Cycle is widely used by businesses to make decisions regarding the adoption of technology, optimize tech investments and improve operational efficiency. It helps them tell hype from reality, and thus make the right investment in the right technology at the right time. 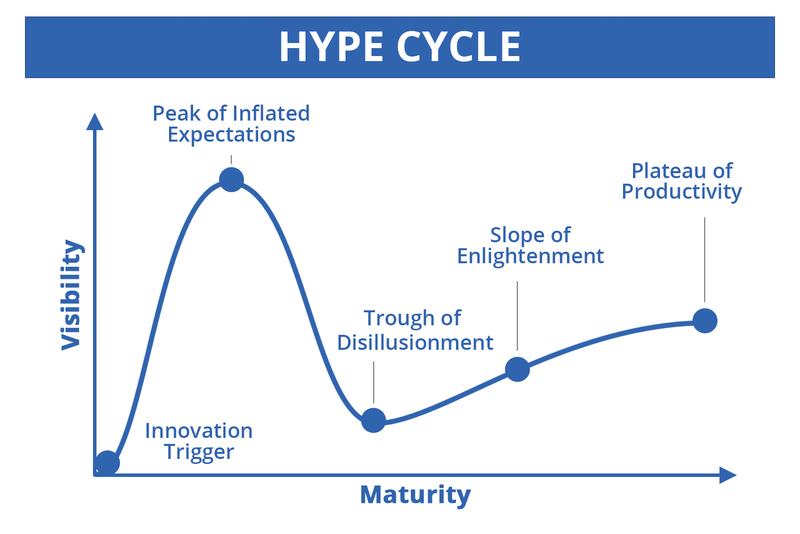 The hype cycle becomes the basis for differentiating between technologies that have only tall claims and no proof, the ones that are viable, and the ones that may become more promising with time. Taking this cycle as the basis, the most attractive stage is the stage is the Peak of Inflated Expectations which is likely to allure you with all the hype that surrounds it. Paradoxically, this is not the right stage for embracing a technology for the vice of the very hype that is characteristic of it. Fortunately, the hype does go away during the Trough of Disillusionment. This stage offers itself for large scale adoption. Since the reality has been laid bare, only those producers with substance stay and add value constantly leading to the Slope of Enlightenment when the technology will end up standardized. If you are getting in between these two stages, before the Plateau of Productivity is reached, the benefits will be the maximum and the best for you. For example, the Internet of Things has been quick to proceed on the Hype Cycle jump around at the Peak of Inflated Expectations in the past four years. While Gartner’s prediction began with suggesting that it will take more than 10 years to reach the plateau, the Hype Cycle for Emerging Technologies 2017 projects that the Internet of Things will reach the same in the next 2 to 5 years. 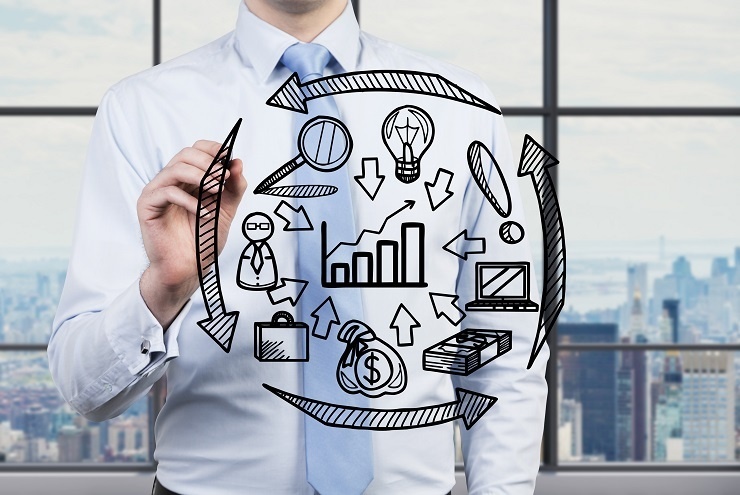 Consequently, IoT is now viewed as a game changer, and so, now is the right time to ride the tide and start preparing a clear business case for it to adopt it in next one year or so. These three frameworks are the fundamental basis to analyze when adopting a new warehouse technology. It helps warehouse managers and other decision makers to make timely decisions, reduce risks, increase of return on investment (ROI), and embrace the warehouse digital transformation. Today, when warehouses are faced by a gamut of technologies, and some of them make sense and others don't, these frameworks come in handy in educating you about when and how to invest. As always, if there is anything else that you would like to know about this topic, or if you need some tips on warehouse digitalization, do not hesitate to comment or contact us.